Chronic renal failure is characterized by gradually progressive loss of renal function. It result from a variety of causes; however, the basic defect is gradually progressive destruction of nephrons which leads to a progressive reduction in glomerular filtration rate leading to increase in blood urea and creatinine, accumulation of toxins, electrolyte imbalance, metabolic acidosis, and disturbance in calcium metabolism. These patients are prone to develop hematological complications, bleeding diathesis, deranged calcium metabolism, neuropathy, and hearing loss. To evaluate the hearing in patients of chronic renal failure, this study was conducted on 52 patients of chronic renal failure attending nephrology unit in a tertiary care centre from January 2009 to December 2009. The results of the findings are presented with the review of literature. To study the correlation between hearing loss and duration of chronic renal failure. A total of 52 patients were included in the study group (28 male and 24 female). These cases were evaluated in nephrology unit and ENT OPD. Cases with past history of hearing loss, ear discharge, diabetes, and hypertension were not included in the study. Thereafter, all patients were subjected to basic tests of renal function Hb, Hct, blood urea, serum creatinine, and blood urea nitrogen). On the basis of the findings of biochemical investigations, GFR was calculated. All these patients were then subjected to clinical evaluation and pure tone audiometry (ALPS advanced digital audiometer AD2000) at 250 Hz, 500 Hz, 1000 Hz, 2000 Hz, 3000 Hz, 4000 Hz, 6000 Hz, and 8000 Hz in a sound treated room. The findings on audiometry were noted and patients were classified according to WHO classification for pure tone audiogram. In 38 patients with hearing loss, mean hearing threshold was calculated at 250 Hz, 500 Hz, 1000 Hz, 2000 Hz, 3000 Hz, 4000 Hz, 6000 Hz, and 8000 Hz to evaluate the severity and pattern of hearing loss in chronic renal failure. To study the effect of duration of disease on hearing threshold all patients of chronic renal failure were divided into two groups - with duration of disease less than two years (21 cases) and more than two years (17). The mean hearing thresholds at different frequencies were compared in both the groups. The significant differences between the hearing thresholds of these two groups were assessed using student's t test for unequal samples. The characteristics of the study group are as shown in [Table 1]. Of the 52 patients, 28 (53.84%) were males and 24 (46.16%) were females. A total of 71.15% (37/52) of the patients were in 21 to 40 year age group. The mean age group was 36.84 years with a standard deviation of 10.80. On the basis of history, deafness was present in 36.53% of the patients followed by vertigo in 23.07% of cases and tinnitus in 19.23% of cases [Table 2]. Of the 104 ears, 76 ears (73.07%) had sensorineural hearing loss and 28 ears (26.93%) had normal hearing on pure tone audiogram. [Table 3] shows severity of hearing loss in 76 ears with sensorineural hearing loss. Majority of the ears had mild (44.73%) or moderate hearing loss (42.11%). 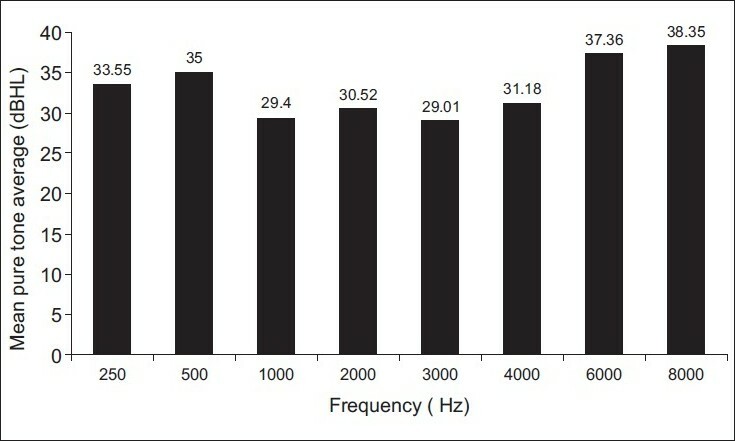 The mean hearing threshold in 76 ears with sensorineural hearing loss at 250 Hz, 500 Hz, 1000 Hz, 2000 Hz, 3000 Hz, 4000 Hz, 6000 Hz, and 8000 Hz is as shown in [Figure 1]. The mean hearing threshold was higher at 250 Hz, 500 Hz, 6000 Hz, and 8000 Hz as compared to mean hearing threshold at 1000, 2000, 3000, and 4000 Hz. The number of ears with duration of CRF less than two years was 42 (55.26%), while number of ears with duration of chronic renal failure more than two years was 34 (44.73%). The mean hearing thresholds at different frequencies is as shown in [Table 4]. There was a significant difference (P<0.05) in mean hearing threshold at 250 Hz in two groups. For rest of the frequencies, the difference in mean hearing threshold was non-significant. Chronic renal failure is characterized by gradually progressive loss of renal function. It is a major cause of morbidity and mortality, particularly in later stages of disease. Approximately one million nephrons are present in each kidney, each contributing to the total GFR. Regardless of the etiology of renal injury, there is gradually progressive destruction of nephrons in patients of chronic renal failure. The kidney has an innate ability to maintain GFR by hyperfiltration and compensatory hypertrophy of the remaining healthy nephrons. The adaptive changes in nephron lead to maladaptive consequences i.e. increase in glomerular filteration causing glomerular injury. Abnormal glomerular permeability further leads to proteinuria. When the renal reserve exhausts, it leads to an increase in plasma level of urea and creatinine. Possible cause of uremic manifestations in chronic renal failure is due to accumulation of toxins due to impairment of renal function. As a result the blood becomes too acidic, bones starts loosing calcium, and nerves starts degenerating leading to sensorineural hearing loss. Sensorineural hearing loss in patients of chronic renal failure is relatively higher in comparison to the general population. Quite a good number of studies show that patients of chronic renal failure have sensorineural hearing loss. ,, In the present study, 73.07% of the ears had sensorineural hearing loss and 26.93% of the ears had normal hearing. Almost similar results were reported by Bazzi et al,  (sensorineural hearing loss in 77%), Kusakari et al,  (60% of the patients had hearing loss) and Charachon  (sensorineural hearing loss in 75% cases) in patients of chronic renal failure. Kusakari  also reported that 36% of the patients had vestibular dysfunction and 26% had a combination of hearing and vestibular dysfunction. Vestibular dysfunction was not evaluated in the present study. Majority of the patients in the present study had mild to moderate sensorineural hearing loss. A total of 44.73% of the ears had mild sensorineural hearing loss, while 42.11% of the ears had moderate sensorineural hearing loss. Ozturan  reported moderate to severe hearing loss in 46% of patients of chronic renal failure. Only a few studies are available showing the mean hearing threshold at all frequency levels. The mean hearing threshold varied from 29.40 dBHL at 1000 Hz to 38.35 dBHL at 8000 Hz. The mean hearing threshold at low frequencies (250 Hz and 500 Hz) and at higher frequencies (4000 Hz, 6000 Hz, and 8000 Hz) was relatively more as compared to that mid frequencies (1000 Hz and 2000 Hz) suggesting the predilection for high and low frequencies involvement in patients of chronic renal failure. Gatland et al,  reported incidence of deafness as 41% in low frequencies, 15% in mid frequencies, and 53% in higher frequencies. However, Johnson et al,  and Antonelli et al,  reported only high frequency hearing loss in patients of chronic renal failure. Ozturan  reported a notch at 6 Khz in patients of chronic renal failure. Stavroulaki et al,  found hearing loss in 55.5% of the children with CRF, with hearing mainly affected at higher frequencies (12 Hz). A variety of causes like electrolyte imbalance,  high blood pressure,  use of ototoxic medication,  vitamin D deficiency,  and inhibition of Na + K + activated ATPase enzyme  (important for maintaining cationic gradients in cochlea) have been suggested for sensorineural hearing loss in patients of chronic renal failure. There was no statistically significant difference in hearing threshold at all frequencies (except at 250 Hz) in patients with duration of illness less than two years and patients with duration of illness more than two years suggesting deafness as an early phenomena in chronic renal failure and it do not progresses further with the duration of disease. There was a statistically significant difference in hearing threshold at 250 Hz suggesting deterioration of hearing at low frequency as the duration of disease increases. This is a significant finding and needs to be studied further in studies with large number of patients. Henrich et al,  showed found that 75% of patients showed no deterioration of hearing during a four-year time of follow-up. Hearing loss is present in majority of the patients of chronic renal failure. Most of the cases have mild to moderate hearing loss. There is a significant association between hearing threshold at 250 Hz with the duration of disease suggesting that hearing threshold worsens at low frequency (250 Hz) as the duration of disease increases. For the rest of the frequencies, there is no significant correlation between hearing loss and the duration of disease. 1. Chonchol M, Spiegel DM. The patients with Chronic Kidney disease. Manual of Nephrology. 7 th ed. Philadelphia: Lippencott, Williams and Wilkins; 2009. p. 185-8. 2. Mancini ML, Dello Strologo L, Bianchi PM, Tieri L, Rizzoni G. Sensorineural hearing loss in patients reaching chronic renal failure in childhood. Pediatr Nephrol 1996;10:38-40. 3. Antonelli AR, Bonfiolii F, Garrubba V, Ghisellini M, Lamoretti MP, Nicolai P, et al. Audiological findings in elderly patient with chronic renal failure. Acta Otolaryngologica 1991;476 (Suppl):54-68. 4. Kligerman AB, Solangi KB, Ventry IM, Goodman AI, Wesely SA. Hearing impairment associated with Chronic renal failure. Laryngoscope: 1981;91:583-92. 5. Bazzi C, Venturini C, Pagani C, Arrigo G, D'Amico G. Hearing loss in short and long term haemodialyzed patients. Nephrol Dial Transpl 1995;10:1865-8. 6. Kusakari J, Kobayashi T, Rokugo M, Arakawa E, Ohyama K, Kawamoto K, et al. The inner ear dysfunction in hemodialysis patients. Tohoku J Exp Med 1981;135:359-69. 7. Charachon R, Moreno-Ribes V, Cordinnier D. Deafness due to renal failure. Clinicopathological study. Ann Otolaryngol Chir Cervicofac 1978;95:179-203. 8. Ozturan O, Lam S. The effect of hemodialysis on hearing using pure tone audiometry and distortion - product otoacoustic emissions. ORL J Otorhinolaryngol 1998;60:306-13. 9. Gatland D, Tucker B, Chalstrey S, Keene M, Baker L. Hearing loss in chronic renal failure - threshold changes following hemodialysis. J R Soc Med 1991;84:587-9. 10. Johnson DW, Wathen RL, Mathog RH. Effect of hemodialysis on hearing threshold. ORL J Otorhinolaryngol 1976;38:129-39. 11. Stavroulaki P, Nikolopoulos TP, Psarommatis I, Apostolopoulos N. Hearing evaluation with distortion product otoacoustic emissions in young patients undergoing hemodialysis. Clin Otolaryngol 2001;26:235-42. 12. Brookes GB. Vitamin D deficiency and deafness 1984 update. Am J Otol 1985;6:102-7. 13. Alder D, Fiehn W, Rirz E. Inhibition of Na + K + stimulated ATPase in cochlea of the guinea pig. A potential cause of disturbed inner ear function in terminal renal failure. Acta Otolaryngol 1980;90:55-60. 14. Henrich W, Thompson P, Bergstrom L, Lum GM. Effect of dialysis on hearing acuity. Nephron 1977;18:348-51.